Senior Research Scientist Adam Schlosser and other JPSPGC researchers find that by 2050 more than half the world’s population will live in water-stressed areas and about a billion or more will not have sufficient water resources. Population growth and increasing social pressures on global water resources have required communities around the globe to focus on the future of water availability. Global climate change is expected to further exacerbate the demands on water-stressed regions. In an effort to assess future water demands and the impacts of climate change, MIT researchers have used a new modeling tool to calculate the ability of global water resources to meet water needs through 2050. The researchers expect 5 billion (52 percent) of the world’s projected 9.7 billion people to live in water-stressed areas by 2050. They also expect about 1 billion more people to be living in areas where water demand exceeds surface-water supply. A large portion of these regions already face water stress — most notably India, Northern Africa and the Middle East. The study applies the MIT Integrated Global System Model Water Resource System (IGSM-WRS), a modeling tool with the ability to assess both changing climate and socioeconomics — allowing the researchers to isolate these two influencers. In studying the socioeconomic changes, they find population and economic growth are responsible for most of the increased water stress. Such changes will lead to an additional 1.8 billion people globally living in water-stressed regions. Looking at the influence of climate change alone, the researchers find a different result. Climate change will have a greater impact on water resources in developed countries. This is because, for instance, changes in precipitation patterns would limit water supplies needed for irrigation. When researchers combine the climate and socioeconomic scenarios, a more complicated picture of future water resources emerges. For example, in India, researchers expect to see significant increases in precipitation, contributing to improved water supplies. However, India’s projected population growth and economic development will cause water demands to outstrip surface-water supply. The MIT team plans to continue this work by focusing on specific regions and conducting more detailed analysis of future climate changes and risks to water systems. They plan to refine and add to the model as they research other regions of the globe. Senior Research Scientist C. Adam Schlosser's primary research interests are the modeling and prediction of global hydrologic, ecologic, and biogeochemical change using the MIT’s Integrated Global Systems Model (IGSM) that includes model development of its terrestrial component – the Global Land System (GLS). 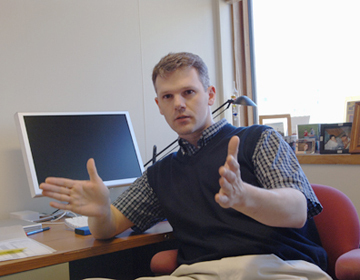 Schlosser is affiliated with the Center for Global Change Science and additionally serves as the Assistant Director of Science Research for MIT's Joint Program on the Science and Policy of Global Change.